Helion & Company, 9781874622086, 281pp. What was it like to drive a Sherman tank into the offensive against Budapest, to lead your platoon through the hell of the Normandy bocage or to face the might of the Red Army in the suburbs of Berlin? 'On the Bloody Road to Berlin' puts you in the front-line of the titanic struggles fought in North-West Europe and on the Eastern Front between June 1944 and May 1945. Follow the course of these campaigns through the eyes of a small number of British, American, Russian and German soldiers. 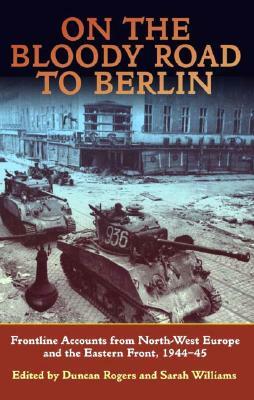 Although the editors provide the necessary background information on a strategic and tactical level, the great majority of this book consists of outstanding first-person narratives of the bitter fighting on the road to Berlin. Eyewitnesses include troops from the British infantry, tank and airborne forces, US infantry, Russian infantry, tank and artillery units, and German infantry and Waffen-SS. Events narrated include the taking of Pegasus Bridge, vicious fighting in Normandy, Operation Bagration, Arnhem, the Ardennes and Alsace, the massive Vistula-Oder offensive in the East and the final battles in Vienna and Berlin. If you ever wanted to know what it felt like to be involved at the sharp end of these battles then look no further than 'On the Bloody Road to Berlin' Key sales points: This extraordinary book features the eyewitness narratives of a small number of Allied and German soldiers relating their experiences of the North-West European and Eastern Front campaigns, June 1944-May 1945, Only a small number of eyewitnesses have been used, thus allowing the reader to thoroughly acquaint themselves with each individual's story, Features rare photos and specially-commissioned maps, Includes previously unpublished accounts, including the fascinating story of female Russian scout on the Eastern Front and a US infantry officer from the 1st 'Big Red One' Infantry Division.